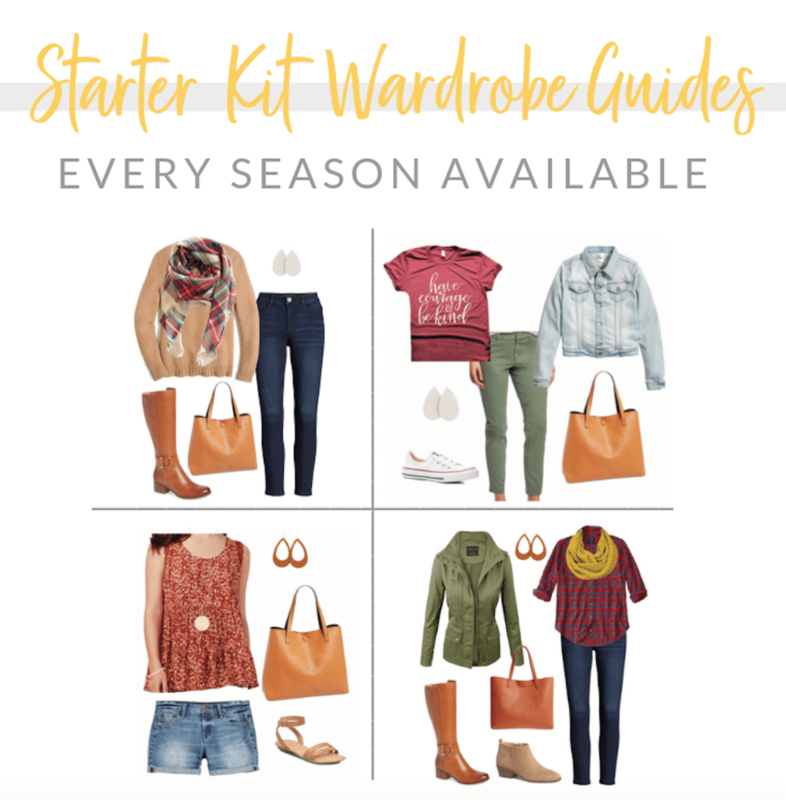 REVIEWS: Skirts for Spring, Joggers, Chinos, and more! SIZING REFERENCE: I’m 5’6″ and usually S/M or 6 in clothes and 8.5 to 9 in shoes. 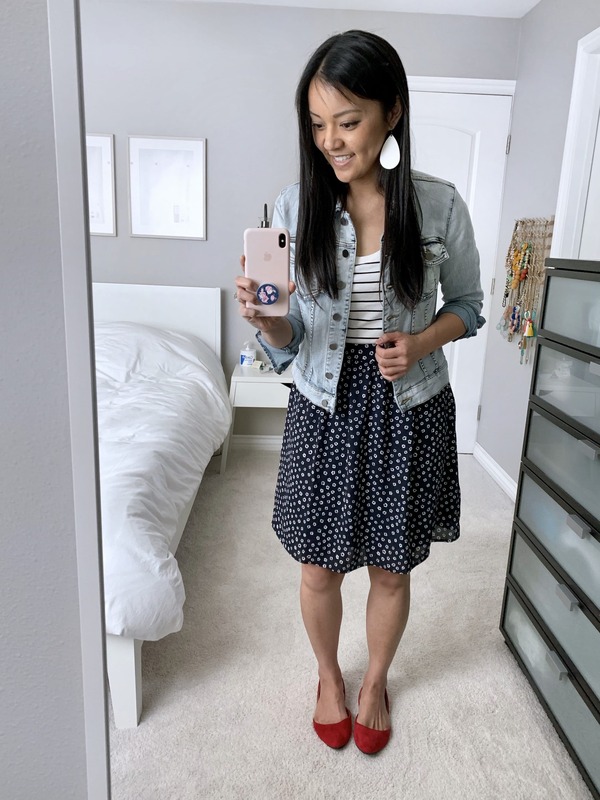 I’m always a fan of a navy printed skirt, and this one is pretty cute! I thought the material would be cotton, which is my bad for not reading the product details carefully. It’s actually polyester with that kind of flowy, silky feel. I feel like that helps it dress up a little better, but you can still easily pair it with a tee for a more casual outfit. It’s very lightweight and is fully lined with a zipper closure in the back. I was hoping it’d have an elastic waistband with pockets, but unfortunately it has neither. Still super cute and easy to wear, though! I wear size 6. See it HERE. 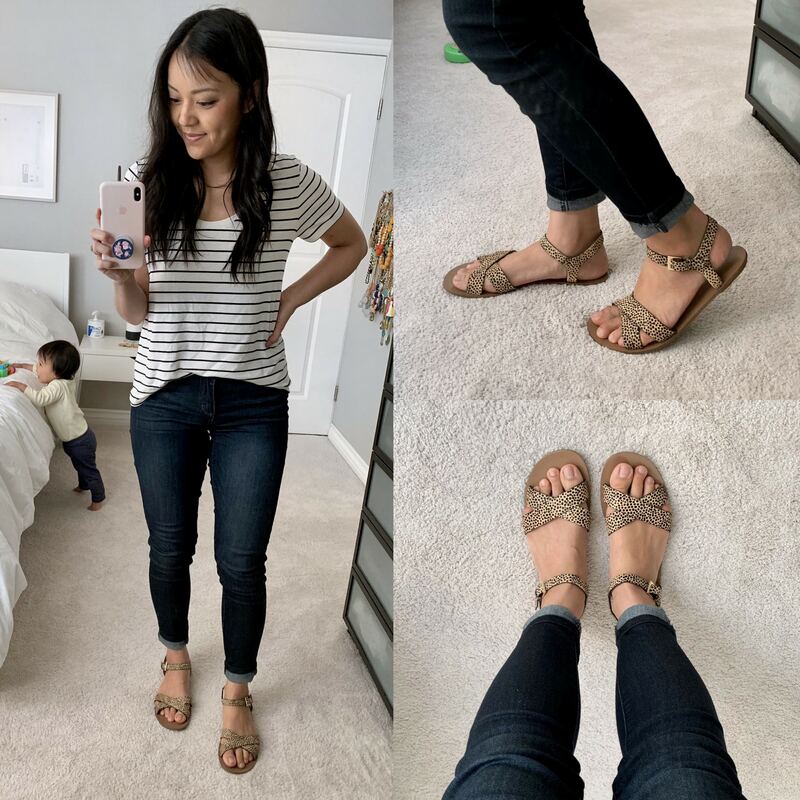 I’ve wanted leopard sandals for quite some time, so when I saw these I knew I had to try them! I think they’re pretty cute, but unfortunately they don’t have any padding and the sole is rather thin. I’m in it mostly for how they look! 😜 I wear size 9, otherwise they’d be too narrow for me. See them HERE. 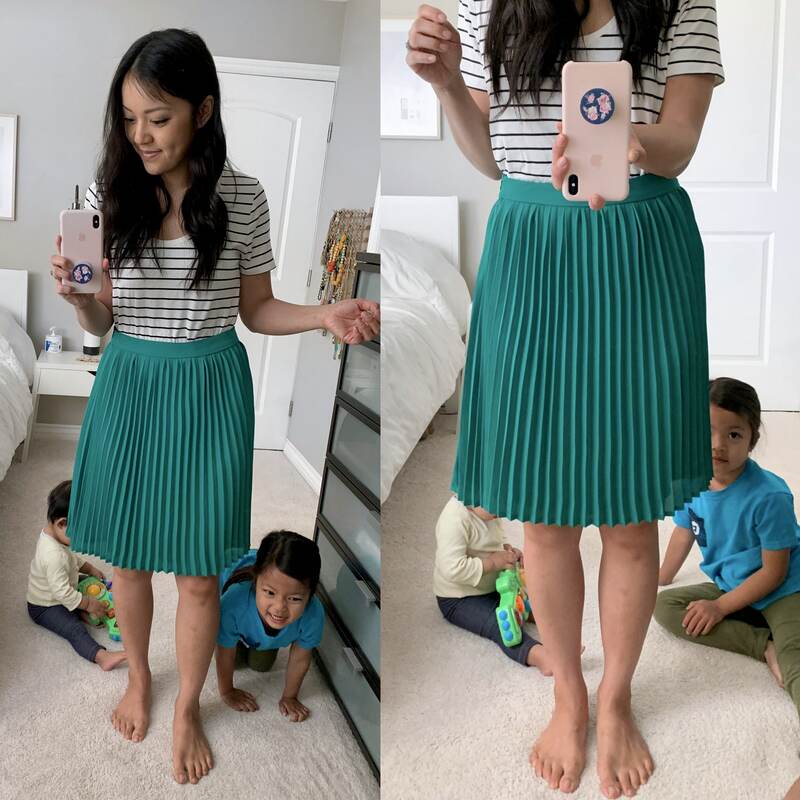 This skirt is very stretchy and comfy and super affordable at under $18! It’s not super duper thin, but it’s not extremely thick either. Like, in the pic on the left you can see my shirt tucked in bunching up underneath. However, I didn’t really work hard to smooth it out before snapping the pic–was kinda in a rush as you can see my kids in the background waiting for me, haha! Also, I usually wear a slip underneath skirts to add thickness and smooth out stuff like that. The pic on the left is the skirt at full length. It’s either super high waisted or more of a midi length. In the pic on the right, I rolled the waistband down once and prefer that look. The color is a darker forest green, even a little darker than my pics above, but not as green as on the product site. 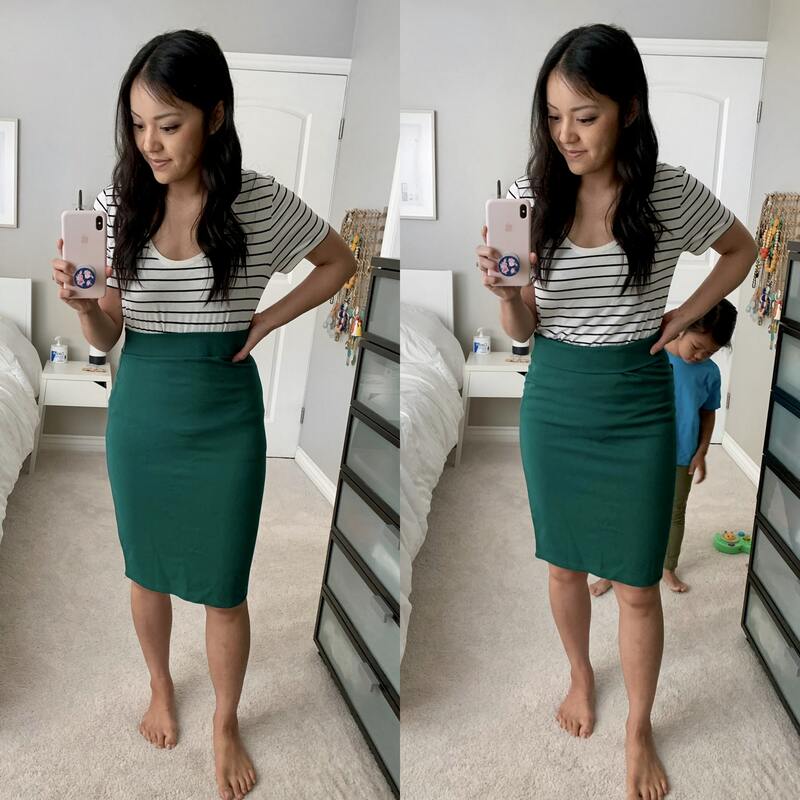 I love jersey pencil skirts like these because they lend themselves well to casual wear, plus they’re comfy! This comes in 16 colors which you can see HERE. It’s available with free shipping and free returns if you’ve got Amazon Prime, which means you can try it risk free. No, this is not a new, hip style where you wear two different colored shoes. 😛 Wearing two different colors to show them to you more efficiently, haha! 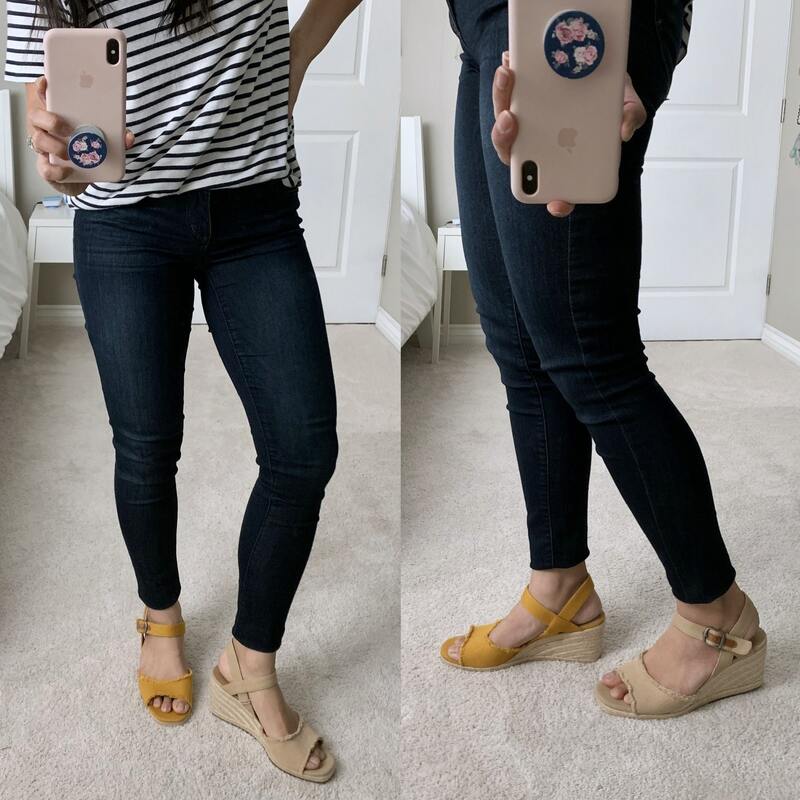 I got these wedges during Nordstrom’s Bonus Points not too long ago, and so far I really like them! I love having a neutral wedge, but they also come in tons of cute colors. I got them in yellow too, of course! The strap around the toe is soft and the wedge has a platform, so despite the heel, they feel fairly easy to walk in. They come in 11 colors HERE. I’m showing both Tavertine and Saffron. Wearing size 9. 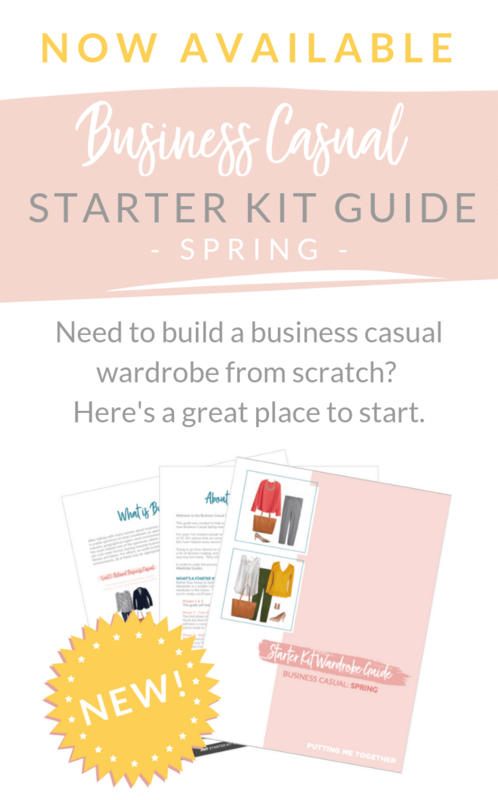 I recently showed this in the post Three Dressy Casual Outfits for Spring, but I wanted to do a more thorough review of it. I LOVE the color of this skirt. It is so much more saturated and therefore a little darker in real life—super hard to capture in pics. It’s seriously gorgeous! It’s fully lined with a zipper on the side. I like that the waistband sits higher (unless it’s too big on you), which I find makes it easier to tuck tops into—more flattering and stays in place better. HOWEVER, one major downside is that sides get a little wonky and don’t lay flat. You can see on the pic on the right, on my right side where my waist hits my hip, there’s that little bump. One thing you can’t see is further down, where the zipper ends on the inside, the skirt tends to curl out. The other side is a bit better but still a bit wonky. If it were a $24 skirt from Target, I wouldn’t mind that at all and would think, “You get what you pay for.” But this thing is really dang expensive, and for that price I’m disappointed that the seams on the side are like this. Just wanted to give you a heads up if you’re considering it. It comes in green, bright pink, and a blush leopard print. See them all HERE. 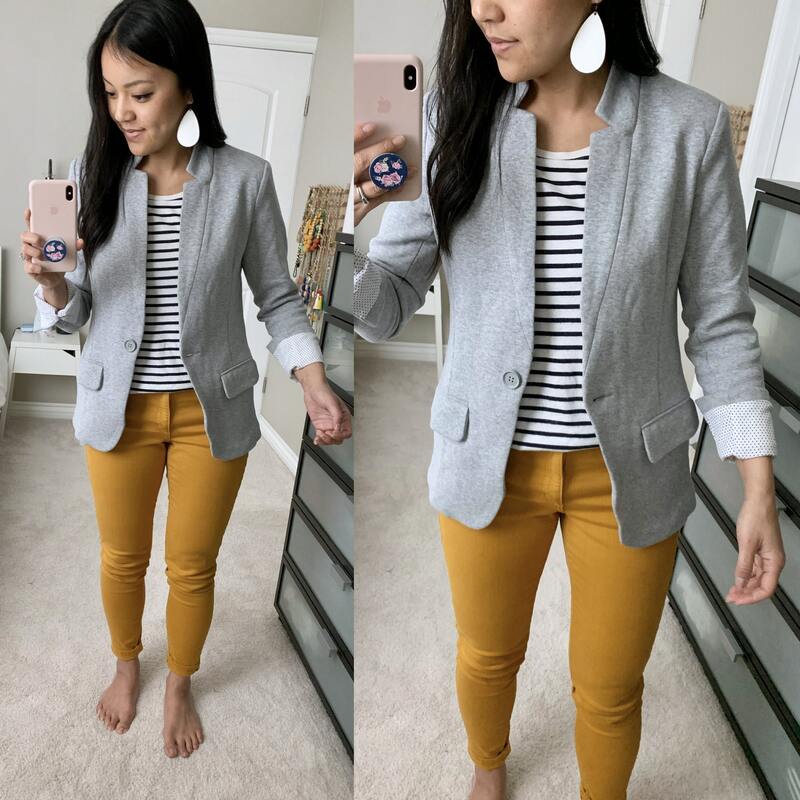 Last July during Nordstrom’s Anniversary Sale, I shared a knit blazer by Olivia Moon that many people fell in love with. It had a nice tailored look with good structure, and because it was knit, it was very soft and stretchy and comfortable–yet, thick! That thing sold out super fast and hasn’t been available for a while, but I recently saw this blazer by Gibson. Lemme tell you, it feels like almost the exact same blazer as the Olivia Moon one! They both even have polka dot lining. I swear they just took the same blazer and slapped different labels on them! Comes in grey, black, ivory, blush pink, and red. See them HERE. This runs quite large, as I’m wearing XS. I need to replace my oversized grey cardigan, so I was hoping this would be it. Overall, I like it. It’s not super thick, rather medium to a little thinner, but it feels kind of how I’d expect a cardigan at this price point to feel. 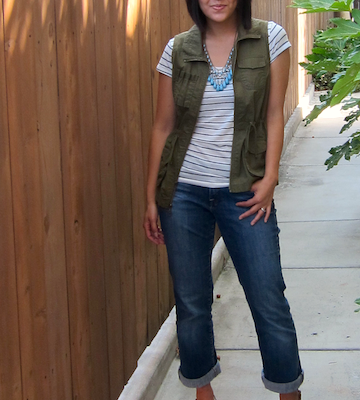 Unfortunately I didn’t care much for the ribbed hem, and it was a dealbreaker for me. 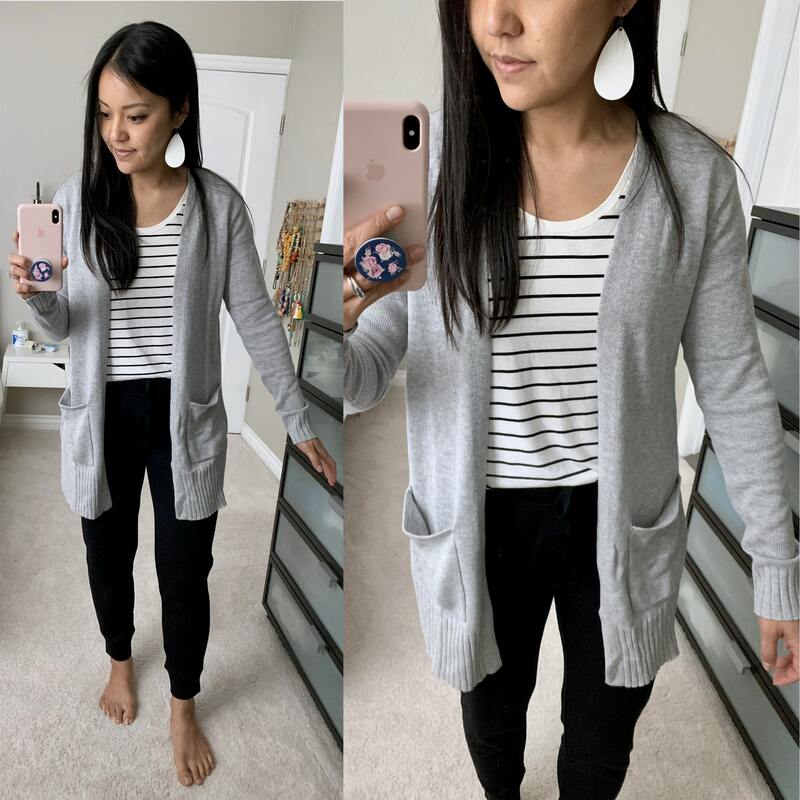 If you don’t mind ribbing like that and want a medium to lighter weight cardigan, give this one a try! It has 4.9 stars and over 700 reviews! Comes in several colors HERE. Wearing size S.
This pair had a nice slim fit that I found quite flattering! I wore them around the house for about two hours (until I had to leave the house), and the knees bagged very, very mildly. So I was like YESSSSS! But then, upon closer inspection, I was skeptical that the material would last long. The joggers are called a “sweater knit,” so they’re fuzzy and soft. But, when I bent my legs and caused the material to stretch a little, I could basically see my skin. That raised concern for me about their durability, so ultimately I sent them back. 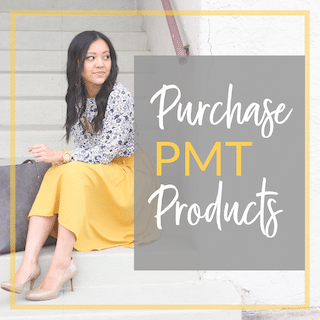 You can catch them on sale for around $15 sometimes, so if you’re in for some super comfy and flattering joggers just for a season, these are worth checking out. They come in black, medium grey, and navy HERE. 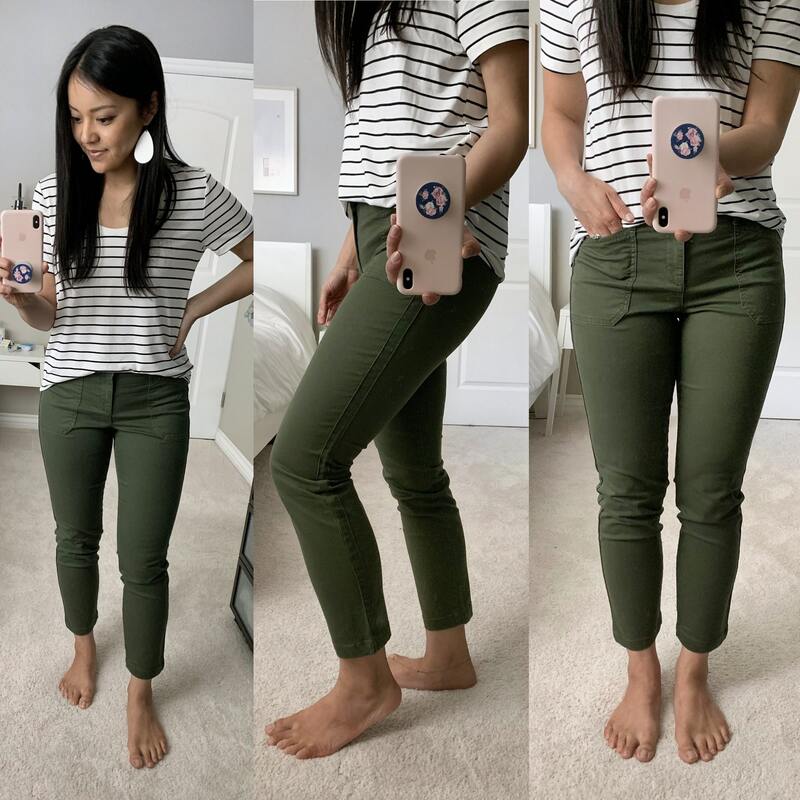 You know I love olive jeans, but for spring and summer I’d like something a little looser and even more relaxed than olive jeans. Always on the lookout for olive chinos or joggers or something similar. These are cute and fit fairly well! I also really like the color. However, I’m still on the fence about them. For the most part I like them a lot! They have some stretch, but I wish they had a little more. When I bend down they feel a bit tight on my thighs, and sizing up wouldn’t help as they’d be too loose everywhere. I was able to wear them for a couple hours around the house, but couldn’t get a full 3 hours in. After two hours they loosened up a BIT but not to the point where they got saggy. That’s a great thing because no one likes saggy pants! But I’m hoping they loosen up just a liiiiiitle more so that there is a bit more room in the thighs. Definitely worth trying, especially since Old Navy offers free shipping and free return shipping! I’ve talked about my recent love for the Kut From the Kloth denim jackets, but since I know they’re not in everyone’s price range, I wanted to try some of the more affordable ones out there. I have found some pretty comfy ones from Target and Old Navy, but it’s VERY rare. I’m talking like years ago I found one from each and the rest between have been rather thick and stiff. This one has amazing reviews online, and I’ve been linking to this as an affordable similar option to what I was wearing before I found the Kut From the Kloth jackets. But now I’m finally trying it, and I’ve gotta be honest–I don’t understand the great reviews. I find it thick and stiff. It looks pretty cute with a nice light wash and decent fit. But it’s not something I would want to wear all day, which is a requirement for me with denim jackets, and therefore not something I’d consider despite the lower price. 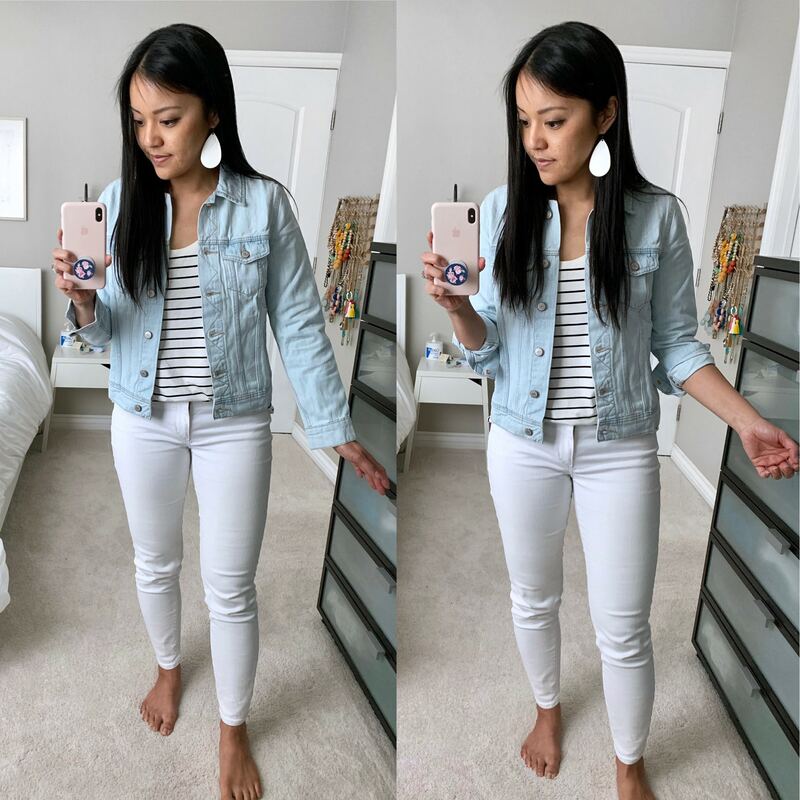 If you don’t mind denim jackets feeling a little stiff, then this is a great option since it’s cute and affordable! Otherwise, I’d stick with Kut From the Kloth because they are just SO dang comfy. They’re lightweight and stretchy and soft. Just so good! Or I’d hold out and continue searching for more comfortable ones at a lower price. See this denim jacket HERE. That’s it for now! There are just a few clear no’s, several I’m 95-100% sure of (I always take soooo long to really truly decide if I’m going to keep something), and a few that I’ll need to test more and see, like the olive chinos and leopard print sandals. 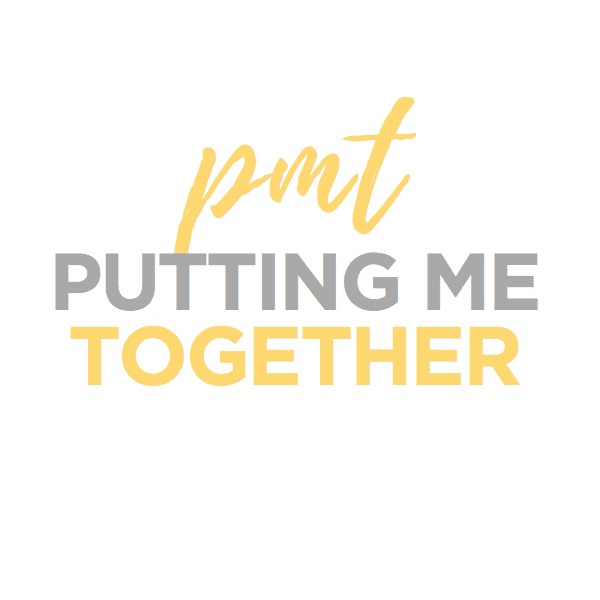 Any items you’re searching for in particular this month? 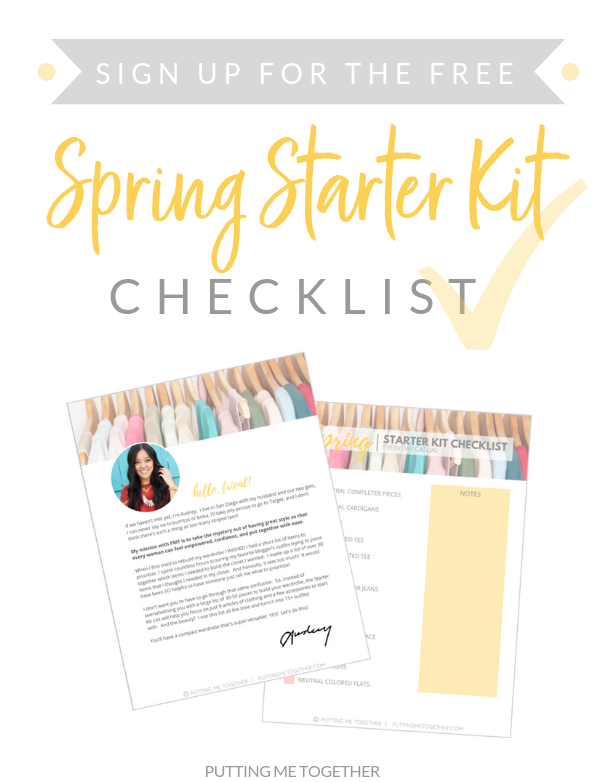 BTW, Nordstrom’s Spring Sale started yesterday! Get up to 50% off on cute spring items that you can also carry into summer! In case you missed it from yesterday’s post, here are some of my favorites. 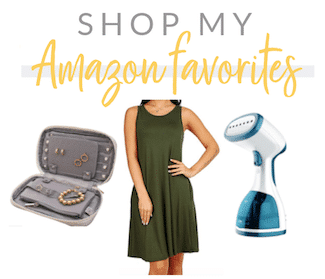 Swipe through the widget below to shop. 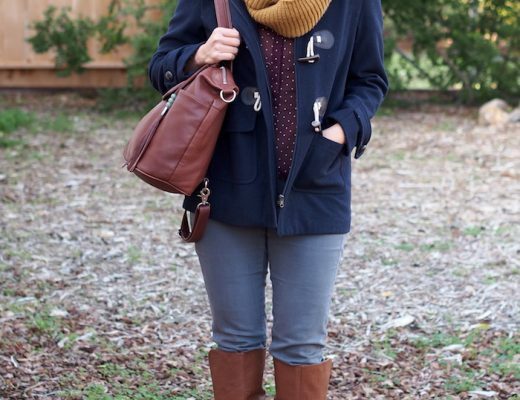 This Color Combo Makes Me Giddy…and New Cognac Boots!